I wish I could say there were lots of great auctions. There weren’t even interesting auctions to talk about. Below are the handful of auctions that I thought were good and/or interesting. If I’ve missed any, then please let me know in the Comments. But know that I don’t want to comment on the same senseless auctions each week. That omits many of the most obviously egregious. But seriously, did I miss anything? – I was going to praise it, but the shipping is just too high. – Can someone explain this price for a dirty lot? – I’ll always have love for $0.99. – This doesn’t feel like a good lot, but it is better than most. – 50 Flesh starting at $15. – I can’t see paying a premium for a Class A when he is a better example of this. – This Tortle made me feels sad. – It is a shame the starting price is so high; some nice bootlegs here. – The clamps I need for repairs. Anyone want the figures? – Is this really from Doom Toys? I don’t remember that. – Yikes. If Doom did this one, then…yikes. I wish I could be cool. I am not. Watching this with my kids really hit me. It filled me with far more feelings than I was expecting. My OT experience was built on VHS. My parents took me to Empire and I stood for the entire movie, but I don’t really remember it. Star Wars was a big part of my life – because it just was. However, I can clearly remember seeing the prequel trailer for the first time. It filled me with hope and excitement. I had rediscovered SW through books, video games, and being a “collector” instead of just playing with toys. It felt more personal than ever. Now I watch it with my boys. We watched it on Laserdisc so they could see the original versions. They only commented on not seeing the Wampa as much; which they liked better. It is amazing to me watching the movies through their eyes. I’m no longer Luke looking off to the future. They are. 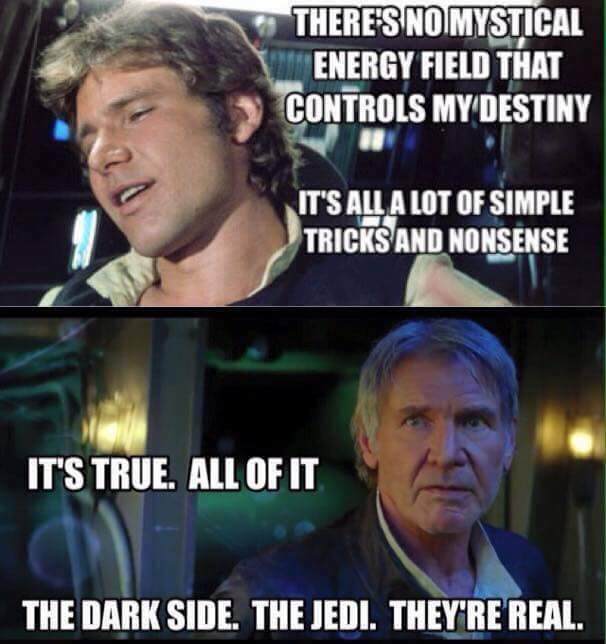 I am sure people will suggest Han has found “god.” Hell, maybe that was the goal. Maybe the movie will negatively change my positive perspective on the scene. It won’t matter. It will be about that moment with my boys. It was real. This entry was posted on Friday, October 23rd, 2015 and is filed under UofM News. You can follow any responses to this entry through RSS 2.0. You can skip to the end and leave a response. Pinging is currently not allowed. If you win that ring (and btw, I know your kids really want that clamp, so I hope you do! ), and really don’t want those figures, I would take them off your hands! I don’t have a gumball bootleg of sunshine yet, or any dekka figures either. Just let me know if you win and what you would need for them! Also, I will admit that the purple screw kid is mine. I was told it would be around 60 dollars, in better shape. I posted it up on my fiancee’s eBay to see what kind of response it would get. I was curious if people would still want it with the slight sun fade on the back of the head, where no one would see it if when it was displayed. I only have one watcher, so I think it is likely that the answer is “No.” Especially considering that I put it with OBO, and have not received any offers for it. I would say this means that the only people willing to pay more for a Class A also only want them to be unaltered in any way, regardless of the discount! When I was collecting I would take a damaged figure. Why not, right?